This November the UN Climate Summit (COP23) will be held in Bonn, Germany, where the imperative will be how to massively scale-up and effectively implement the Paris Climate Agreement. The Global Ecovillage Network (GEN) strongly believes that sustainable communities are already making significant contributions to climate change mitigation and adaptation. For decades, GEN has been showing how regenerative permaculture solutions and ecovillage approaches to sustainable development are making a significant contribution to drawing down carbon from the atmosphere and reversing global warming. From low-tech natural carbon sequestration techniques, regenerative agricultural practices, large scale water retention landscape regeneration methods, and radically low ecological footprints, ecovillages are demonstrating that the changes in lifestyle and consumption, along with the best practices needed to achieve ecological sustainability, are attractive and attainable. With your help we can continue this work. GEN has put together a crowdfunding campaign to 1) enable a platform for four ecovillage experts, all hailing from the Global South, to attend COP23, and 2) support the ongoing development of our Pan-African Ecovillage Development Programme which addresses both climate change mitigation and adaptation. “School and College communities producing nutritious food and useful products; providing countless learning possibilities for the curricula; serving as resource centres within communities; and contributing to the development of the whole person”. Rescope has spearheaded the outreach and training in permaculture and agroecological techniques across Southern and Eastern Africa. 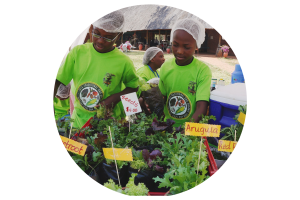 Partners with GEN since 2014, one of our collaborative programmes has been to promote Greening Schools whereby education centres in Zambia become hubs for healthy nutrition, improved personal relations, and community building. Instrumental in the initiation of GEN Africa, SEKEM is a beacon of inspiration for ecovillage development and has worked for over 40 years to promote authentic human development in harmony with the natural world. 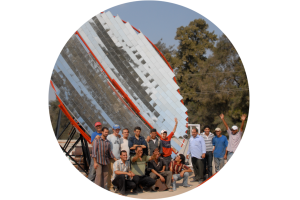 SEKEM is a partner within the Ecovillage Development Programme. As the effects of climate change increase in intensity and impact, both Globally Northern and Southern become more vulnerable together. The recent devastating hurricanes and droughts in both Asia and the United States have only further illustrated this. As we know, humanity is already living well beyond the carrying capacity of the earth. Climate change is leading to deaths, population movements and political volatility. However, communities worldwide are gradually building regenerative institutions, changing behaviour, and building policy support for carbon reductions instead. With your help, GEN can continue to support communities across the African continent to build climate change resilience. We can together take our crowdfunder to the next level and stand in solidarity for climate solutions, environmental justice and a regenerative future. You can support our Crowdfunder to bring climate activists from the Global South to COP23, and to strengthen the Pan-African Ecovillage Development Programme by following this link.